All the Gear, Every Time You Ride! 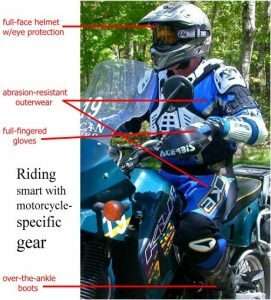 All the gear all the time, or ATGATT, simply means wearing personal protective equipment designed for motorcycling, including a quality motorcycle helmet, every time you ride. Much of this apparel is constructed with reflective materials, so it not only helps keep you safer in the event of a crash, it could also help prevent a crash from occurring in the first place by making you more visible to other motorists. 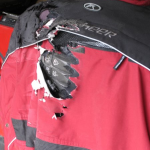 This gear did the job it was designed to do, and the rider – and his skin and bones – is glad he was wearing a protective armored coat at the time the motorcycle collided with a deer. 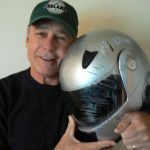 This helmet did the job it was designed to do, and the rider – and his face, head and brain – is glad he was wearing a full-face helmet at the time the motorcycle he and his wife were riding and collided with a deer. SMARTER riders are covered, comfortable, conspicuous, and contemporary. The bright- and light-colored gear and helmets are definitely NOT your father’s “colors”!